If you're looking to freshen up your space, you're probably interested in knowing what are the home decor trends for this fall season. The fall brings us a variety of ideas that can readily be incorporated into your home. Color. Greys and a more muted palette have reigned for awhile now, and we are seeing a gravitation to color. Especially fall hues are on trend right now! By now, you've probably been overloaded on pink. However, paired with black, this color combination creates a great juxtaposition that keeps a space from seeming too sweet. Black and pink are right on trend for this season. Simple furniture. Pared down furniture and materials which are more natural are coming in style. It reminds me of a beachy look from a California or Australia beach town. Woods with grain that show are more in favor over glossy, painted surfaces. You can go more simple, or you can go more dramatic with an Art Deco inspired trend. This includes geometric patterns, curves, brass and other luxurious materials. This includes a move to metallics, but toned down - think brass and gunmetal. Soft to the touch. Velvet has long been a favorite material of mine, and I'm happy to see it is gaining even more traction. 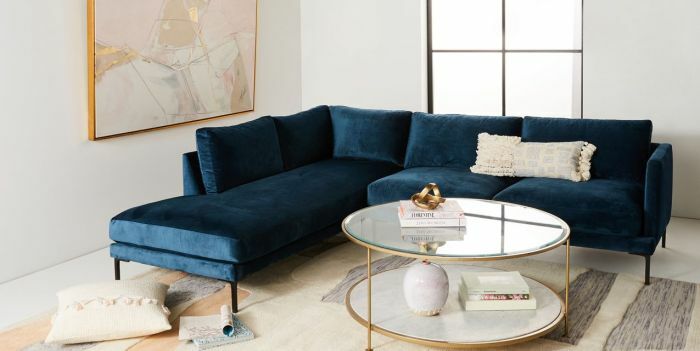 Velvet sofas, chaises, pillows and chairs will keep popping up this season. Click through to read more about the home trends for this fall.